2018: Be Part of Our Best DSC Yet! It seems the Biltmore properties are now just part of our DNA! Although not affiliated with the Arizona Biltmore, our 2016 location, the Biltmore Hotel and Resort in Miami-Coral Gables is another exquisite gem of a location for our conference. A favorite of world leaders and celebrities since its opening in 1926, the hotel offers a restored Donald Ross 18-hole, 71-par championship golf course; tennis courts; the largest hotel pool on the East Coast of the United States with private cabanas; a European spa and a renowned fitness center. The 273-room resort includes 133 suites and features spectacular Mediterranean architecture with classic Italian, Moorish, and Spanish influences spread over 150 acres of tropical landscape. Add to this some truly gorgeous meeting spaces for our presentations. Which is great, because we'll be video recording several presentations for our exclusive web library covering the basics of different materials, as requested by interior designers from Gensler, Marriott and others, as well as furniture designers and buyers from retailers like Walmart, Target and Overstock.com. Those of you who were part of our 2016 and 2017 events know that the commercial design community has been begging us for positive stories for them to help place more of our materials. It's time we answered the call! Our Best Program Ever? You better believe It! Meeting the Needs of Retailers Selling RTA Furniture - We've been working with furniture designers and buyers for the world's largest retail stores to better understand their efforts to deliver better quality, design and value to their consumers. We'll be sharing some of their very specific concerns and requests. LVT, Décor Design and Eco-Friendly Substrates: Are design and material trends in resilient flooring and laminates converging? Mark Danner, laminates industry veteran and Senior Designer at Tarkett, brings us up to speed. Sustainability Messaging - Perspectives from a sustainability specialist from one of the major European surface suppliers, and progress on the formaldehyde issue. Future Specifiers - Understanding the thinking of the next generations of furniture and interior design specifiers will also help us understand the values of the consumers of the future. The Growing Role of Digital Scanning and Printing - Printed textures are coming! 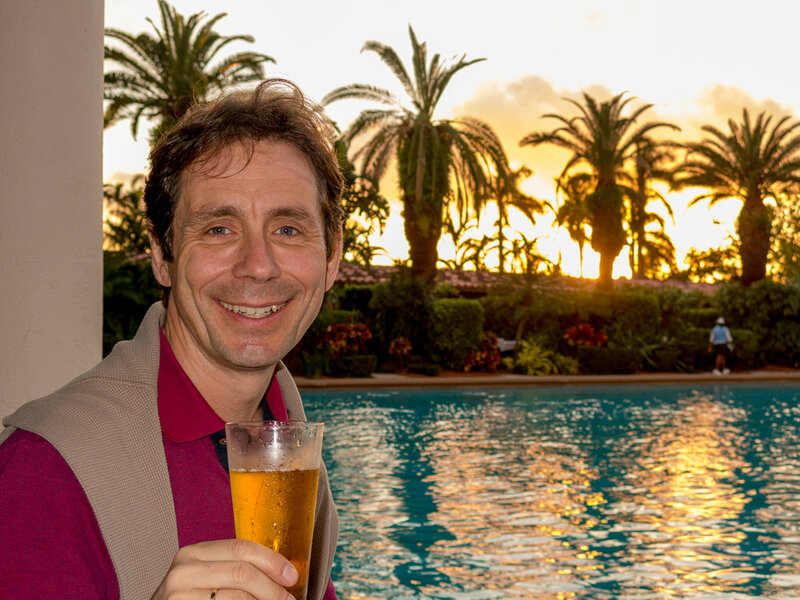 Dr. Kurt Fischer takes the Biltmore pool bar out for a spin. Fore! Cannonball! Make mine a double. And yes, there will be some R&R as well. We'll be golfing on the 4th, and Miami's international Art Basel event starts just as we're wrapping up. The property has one of the top restaurants in the country, a huge pool (did we mention the pool? ), and a relaxing ambiance with that groovy Miami vibe. The conference opens on 4 December with golf and an opening reception in the evening. The official program begins at 9 am on 5 December, and concludes at 5 pm on 6 December. Our Laminates Hall of Fame Dinner will be held the evening of 5 December. Fill out this form and we'll send you an invoice by email with convenient payment options. Be sure to register above first, and choose the correct option below. Easy peasy! Discounted Rooms at the Biltmore -Book Before 4 November! We have negotiated a discounted rate of $229 for DSC18 delegates. Click on the link below and enter promo code 3420 to lock in this special rate. You must book before 4 November to receive the discountedconference rate.